Do you have stairs that could use a bit of a facelift? You have some great ideas, but you’re hesitant to do anything permanent? 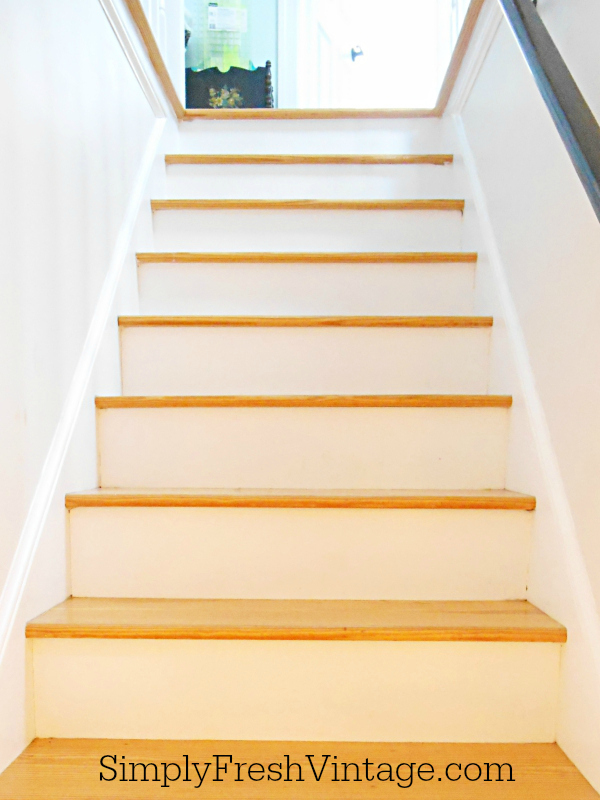 I’ll show you how to transform your stairs in less than an hour! This is our back stairway … the one that goes from the mudroom to my quilt studio and office. Because of the way the stairs are positioned, there are only a few hours of the day where it’s fairly bright. The rest of the day, though, it’s pretty dull and even kind of dark. I wanted something that would brighten my day and help me look forward to going into the studio to work. This is one of those types of projects that you think is way too difficult to even try to tackle. I’ve got great news … this is simple … really, really simple. Trust me. 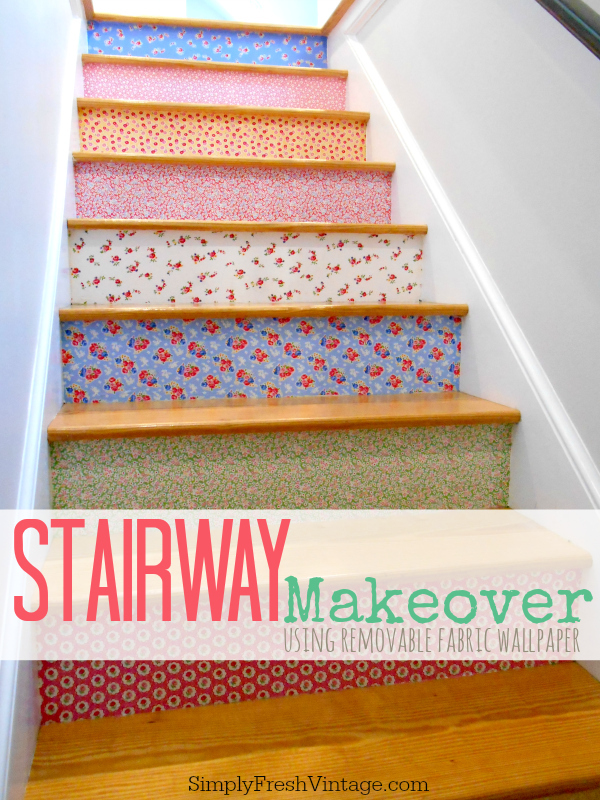 In 6 easy steps, you, too, can have a stairway makeover that the whole neighborhood will be oohing and aahing over. And the best part of all? It’s completely removable without doing any damage to the surface underneath! The only warning I have is that this project is messy, the gooey, wet, icky kind of messy. Fortunately it’s all completely washable. 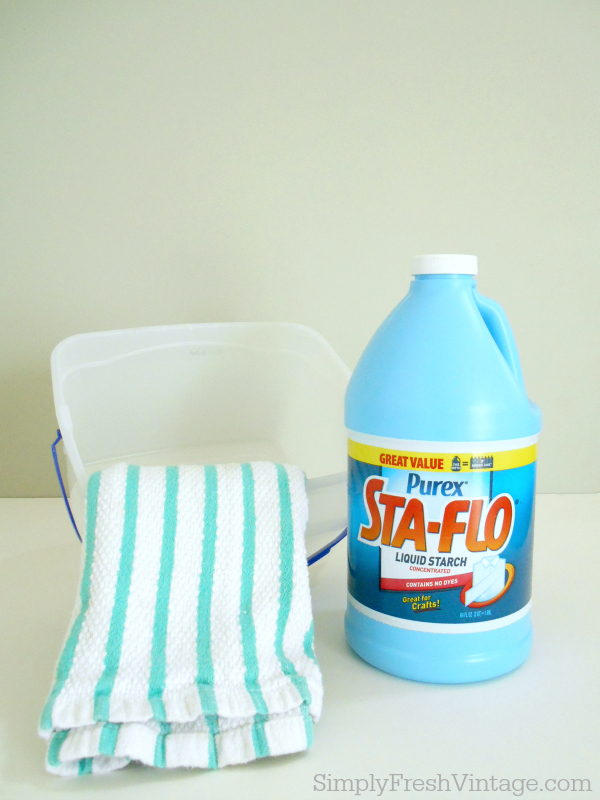 The only supply items you will need are a 1/2 gallon bottle of Purex Sta-Flo Liquid Starch, an empty container (I used a leftover ice cream bucket), and a dishrag. A pair of scissors will come in handy too. And you’ll need a box/sheet rock cutter to finish the project off. That’s it! The beauty of this project is that it uses fabric, not paper. Since I’m a quilter, there is no shortage of fabric around here. The color scheme you use is completely up to you. You can use the same fabric for all your risers, alternate between two or three or four, or make every one different like I did. 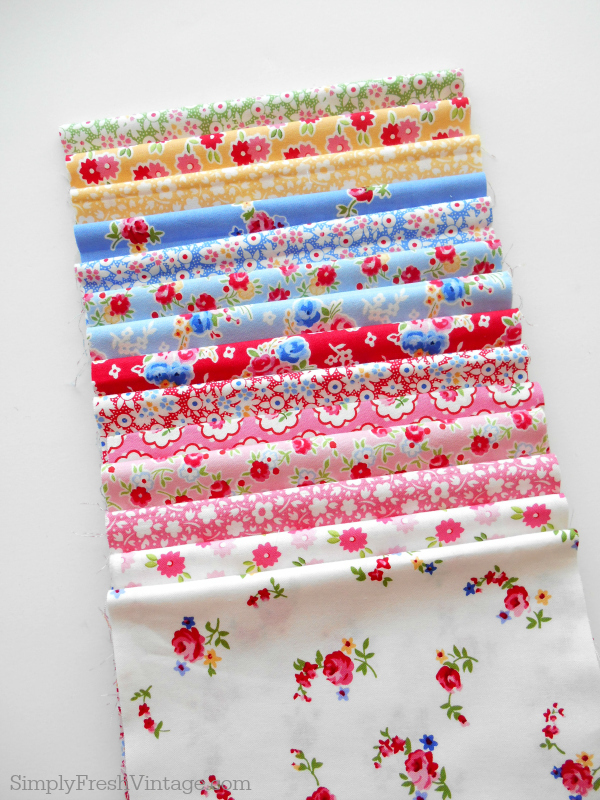 A great source for finding good quality fabric is Fat Quarter Shop. 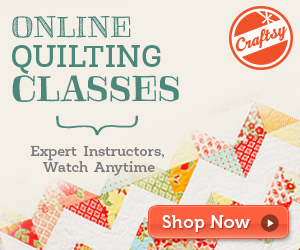 You can also search “quilting fabric” on Etsy. The fabrics I used are from Lakehouse. I used 100% quality quilters cotton. These fabrics are a little pricier, but there’s absolutely no shrinkage or color loss. 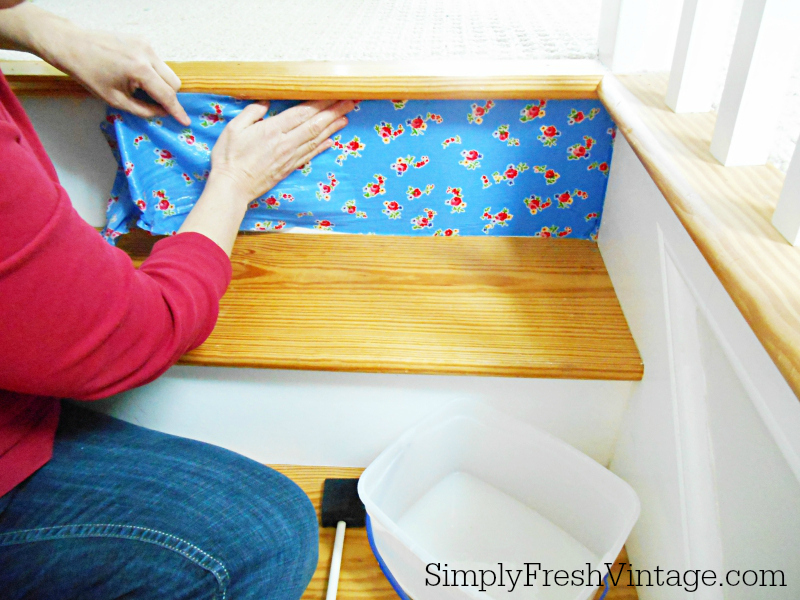 If you remove these fabrics from the stairs at a later date, you can throw them in the washing machine and easily use them for another project. No waste! That depends on a couple of factors: a) how many risers you are covering; and, b) the height and width of the risers. I have 16 risers. All of them are 32″ wide. Two of them are about 6″ high and the rest are 7″ high. In determining the quantity of fabric I needed, I factored 1/4 yard of fabric per riser. A quarter yard is 9″ x ~42″, so that is a good measurement to work with. If your stairs are wider than ~40″, then you might want to consider using home decor fabric since it’s usually about 60″ wide. A great source for home decor fabrics is OnlineFabricStore.net. Prior to starting, you’ll want to make sure that you’ve swept, dusted, or vacuumed your stairs. You’d be surprised how much yuck is hanging out in those corners. Step 1 … Pour about an inch to an inch and a half of liquid starch into your container. 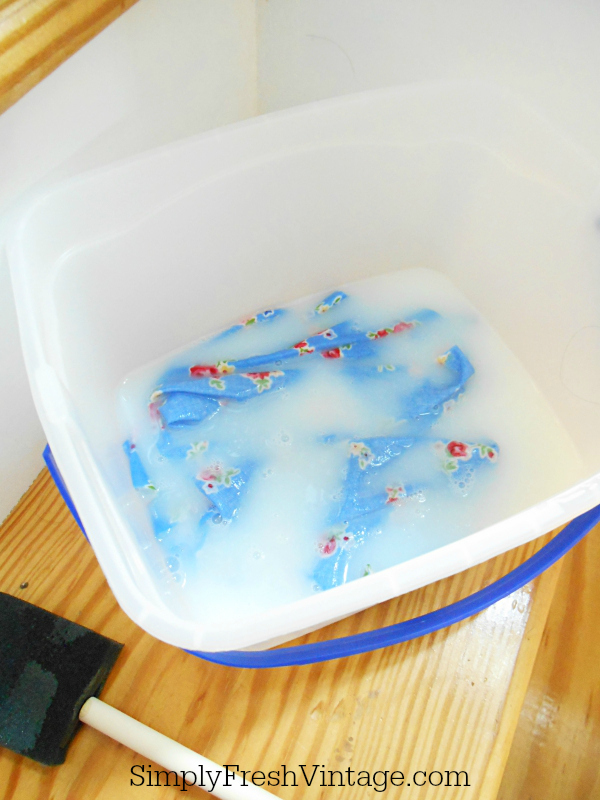 Step 2 … Dunk one of your fabric pieces in the liquid starch. NOTE: I did notice that some of the pigment (especially from the red) tinted the starch, however it did not seem to affect the outcome of the fabrics that followed. I had a white fabric after a pink and a red, and even though the starch was somewhat pink by then, when everything dried, my white fabric didn’t take on any of the tint. Step 3 … Quickly grab one end of the fabric and with the other hand, squeeze out the excess liquid starch. You want it to be wet, but not saturated. 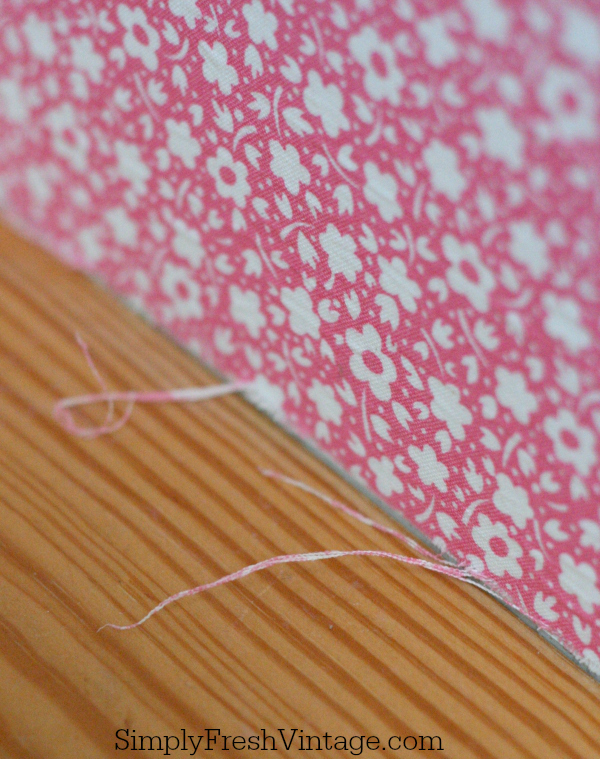 Step 4 … Starting on either side, apply the fabric (right side facing you) to the riser. Line up the bottom edge with the stair tread. Let about 3/4″ extend on the side. You should have about 1/2″ to tuck underneath the tread above. 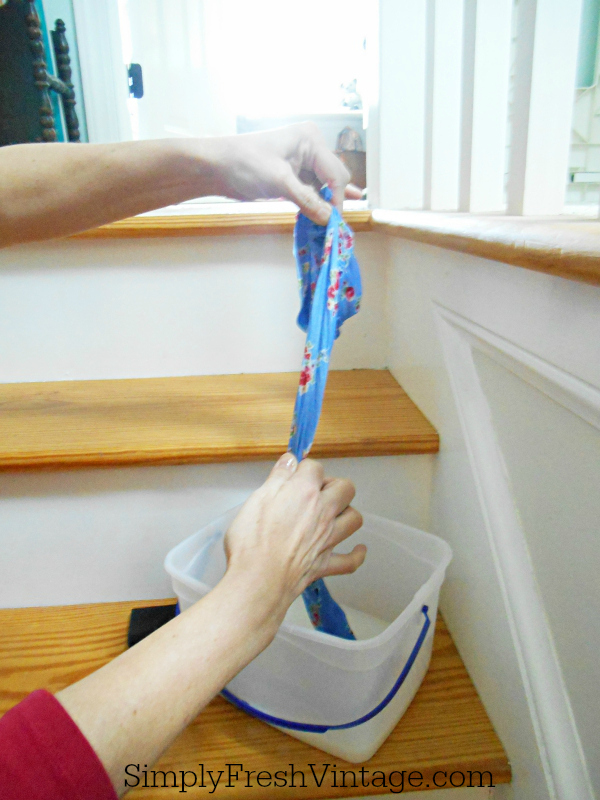 Use your fingers to smooth out the fabric and remove any bubbles or wrinkles. The starch will not start to dry immediately, so you’ll have plenty of time to maneuver it. TIP: After you get it completely in place, close your eyes and go back over it with your fingers to make sure everything is smooth. Removing the sense of sight enhances your sense of touch. Here you can see how the fabric is extended on the right. The same should happen on the left. We’ll cut this all away later when everything is completely dry. If your fabric starts to fray, you have two choices, let it dry and cut it away later, or using sharp scissors, cut it now. Just be careful not to pull it any more. Repeat these 4 steps for each riser. The first one or two will take the longest because you’re becoming familiar with how all of it feels and works. By the third riser, though, you should really start to get the hang of it. After a few risers were done, I was getting each one done at about 2-1/2 to 3 minutes each. Once I had all my fabric cut and supplies gathered, it took me less than an hour to cover all 16 risers. Remember that sweet little tune from Barney? Start singing! 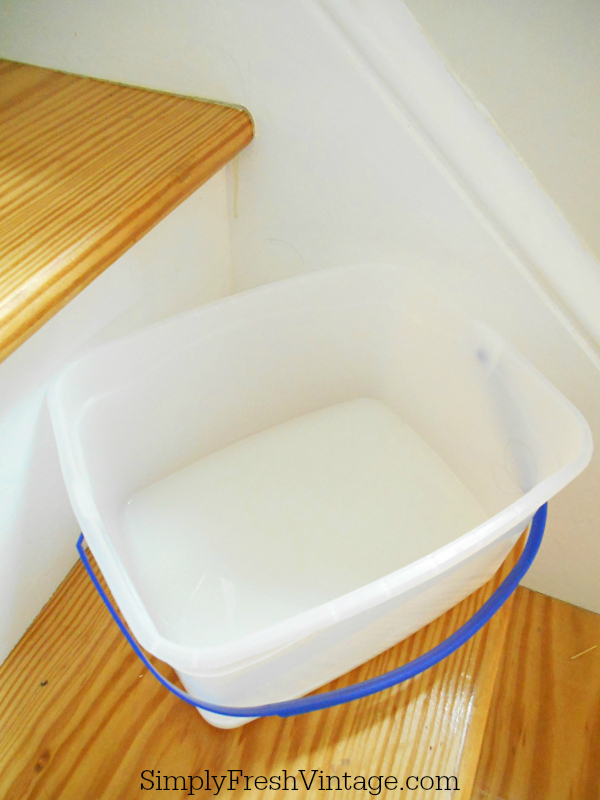 Go ahead and dump any leftover starch and using a damp washrag or sponge and old towel, wipe down and dry the stair treads. If you used scissors, give them a wipe and dry too. Whether you tackle this project in the morning, afternoon, or evening, you’ll want to let it sit overnight and get completely dry. Don’t even try to trim off any excess fabric until the next day. 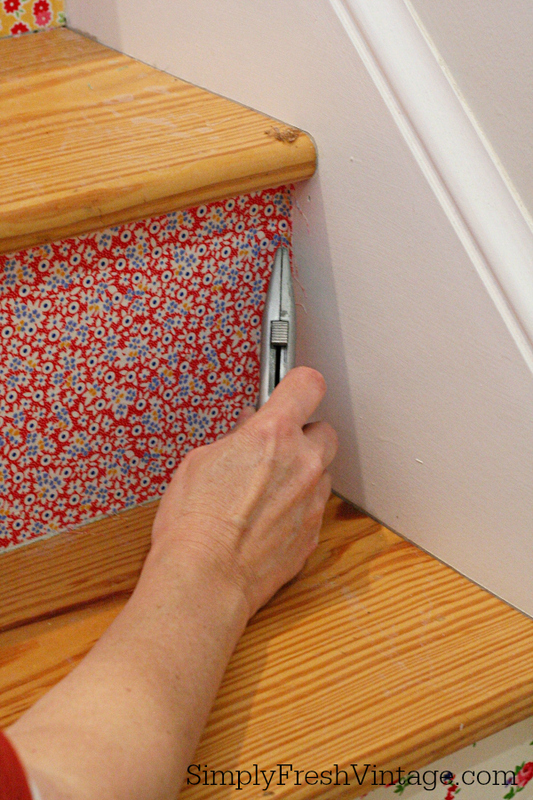 Step 5 … Morning has broken and now it’s time to finish up your stairway makeover. This will take about 15-20 minutes at the most. Using a new blade in a box or sheet rock cutter, run the blade along the edge where the riser meets the wall. If it’s difficult to cut away at the top and bottom, go ahead and peel the fabric from the corners to get a clean cut. You can use scissors here as well. Step 6 … After you’ve cut away the excess, if you’ve pulled out the corners, dip a small brush in some liquid starch and “paint” the starch over the fabric. It’ll stick right to the riser without any problems. And that’s it! Six simple steps, and your stairs will be filled with color and texture. So … what happens if you get tired of your new look and want something different? As easy as it was to peel away the corners, is exactly how the rest should come off. If you aren’t convinced that it’s that simple, then just wipe the fabric with a wet hot towel and it will definitely peel right off. Wipe the riser again to remove any excess starch. Then you have a fresh canvas to work with. I love that you can use different patterns, or even solid colors. Maybe even try different textures. The possibilities are endless. It’s the perfect solution for those that rent and want to add color to their decorating without damaging surfaces. And just in case you were wondering … this technique works on any flat surface. Start with the stairs and work up to some walls. You’ll need to be a bit more careful and take more time with the walls, though, especially if you are using a print with a specific design that requires matching. So what are you waiting for? 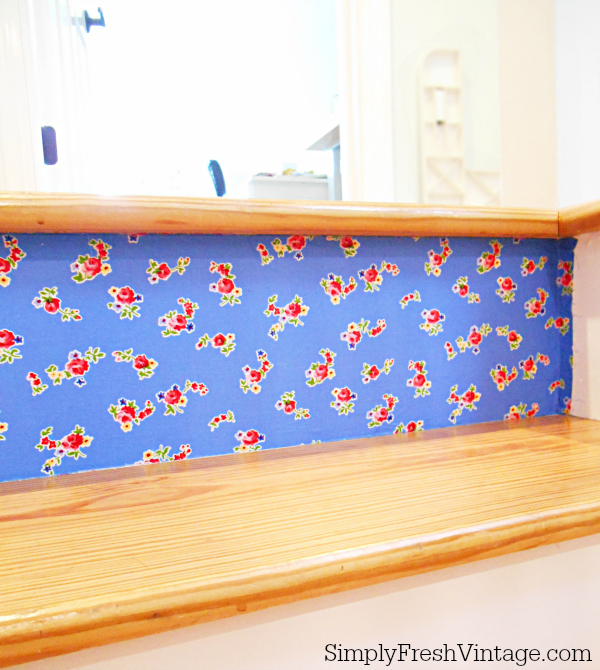 Go give your stairs the Stairway Makeover they deserve! I love it when I can team up with the best of the best in DIY projects, decor, and crafts. I’ve joined with 24 bloggers as we share our best ideas for decorating your home, updating furniture, home DIY projects, gardening projects, and even some spring crafts. I’ve worked with all of these ladies before and every time they create something new, they hit it out of the park. This hop is no exception. 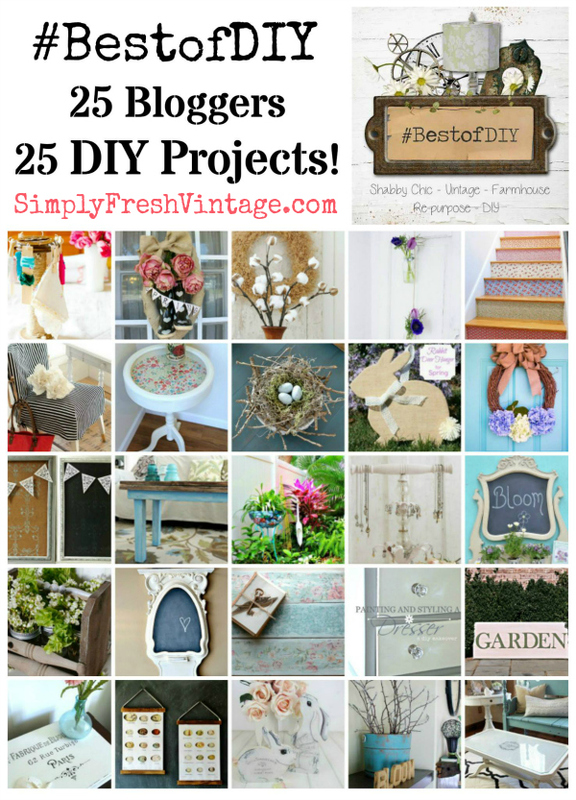 This truly is the #BestofDIY (search this hashtag on all social media sites for even more inspiration.) Are you ready to do some blog hopping? I hope so! 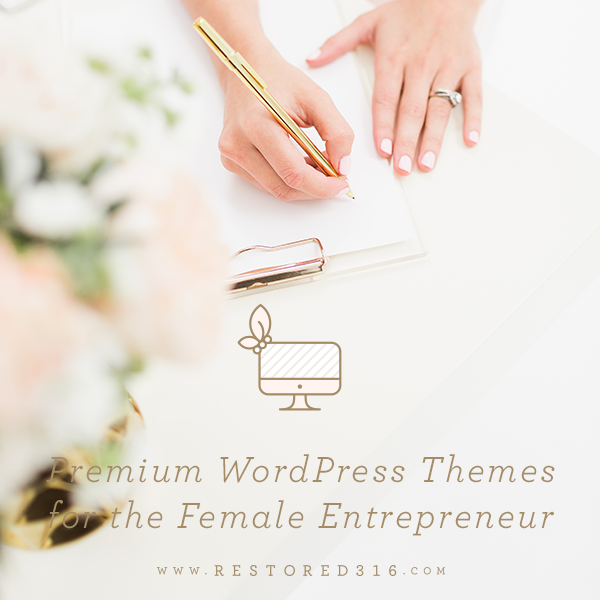 These 25 ladies have some amazing projects to share with you. Show them your love by leaving comments and sharing their amazing talent. I love the bold approach you take to remodeling your stairway! It definitely adds an element of brightness that wouldn’t usually be there. I need to start thinking out of the box for our new staircase! Wow what a great idea for stairs! Too bad I don’t have any in my home to redo, but I love your fabric choices. So cute! Thank you so much Hannah! This process can be used for walls, doors, just about anything you want to add a punch of color too without it being permanent. Do you think this would work for my outside steps coming up my deck? My only concern with using the starch is that when it rains, it would probably dissolve the starch. However, you could definitely use the same general principles and maybe use some kind of a glue, or something else that would hold up to weather conditions. Let me know if you try it! Would love to see the results. I wonder if I could use orphan blocks to do this or if the seams would create a problem??? Guess I just need to try it and find out!! Best part, I don’t even have to iron them before using them! I think that would be a great idea, Susan, and I don’t think the seams would be a problem. Would love to see a picture! WOW – I love your steps! What a fabulous idea. Too bad I don’t have steps in my house. I looked up and saw my kitchen cabinets….ummm….probably not. My daughter did something like this in her kids bedrooms. 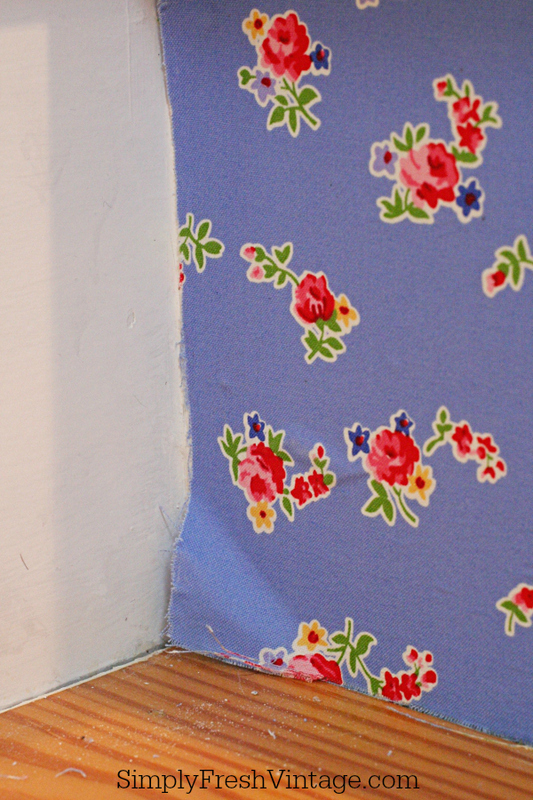 They were renting and couldn’t paint, so she starched fabric on a wall and it was just adorable! Pink and girly for the new baby. You chose perfect colors for your steps! Thank you so much Patti 🙂 Yes, this method definitely works for walls, especially in rentals. It’s the perfect way to add non-permanent color, design, and texture. I love this project! I would love it if you could share it at next Wednesday’s A Little Bit of Everything Link Up Party at Mom Home Guide! LOVE, LOVE, LOVE! I am contemplating ripping the carpet off of my staircase just so I can do this, although hubby may not go for that 😉 Seriously, so creative! How awesome is that? I love how colorful and welcoming the fabric makes your staircase. Excellent tutorial too! I adore your happy stairs, Lani! What an awesome, creative way to dress them up. This is a perfect way to accent the stairs leading to your quilt studio. I love the colorful look it gives your stairs and also the pretty fabrics that you chose. The easy removal in the future is an added bonus. Fun project! That is totally awesome! Since I play with fabric all the time I really think I should do this with some of my scraps! This looks so bright and cheerful! lovely! You of course will know that I absolutely LOVE this project Lani. How super inspiring and uplifting to have an entrance like that to your creative space. Great tutorial and another fabulous #BestofDIY project. You prob go up and down the stairs happily now! They look really nice. I loved seeing how this turned out! It makes me happy when I see my Pam Kitty fabric used, especially in such a fun way!!! It looks great! Such a beautiful welcome to your studio Lani. I love the fabrics you chose. You made this project look so easy. Thanks for sharing and inspiring me. Wow! That’s just stunning. What a pretty staircase. Wow! This is an amazing stair makeover! I would love to do something like this! Love the stair makeover. I have been wanting to apply fabric over some 1970s smoke mirrors behind our bed. Now I feel more confident. Thank you. That stair case is gorgeous! Makes me wish we had a staircase I’d be doing this!.Love it!! The fabrics are beautiful. I agree with Jann you got that done so fast. Lani! This is one of the most creative and fun diy’s I’ve ever seen! I adore your colorful steps. Going up and down these fun steps would be pure joy!!!! Lani…..I LOVE this! Wow you did a beautiful job! I have seen this technique on walls before but not on steps. Great idea because it’s easy to do but easy to change if you get tired of it.Love the fabrics too! Lani, I LOVE this project! 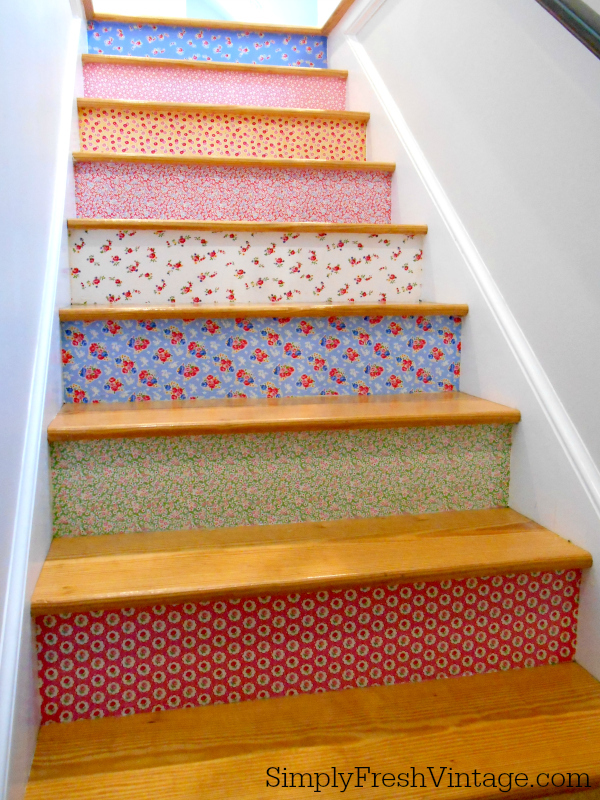 What a great way to brighten your stairway, and I love the fabrics you picked. Great job! It probably would have taken me much longer to do, I’m impressed that you could do it so fast!